We are studying the temporal behavior of a magneto-optical trapping apparatus allowing simultaneous cooling and trapping of Cs and Rb in a compact octagonal vapor cell. The background vapor pressures of each species are independently controllable, as are the intensities and frequencies of the respective trapping and repump lasers. 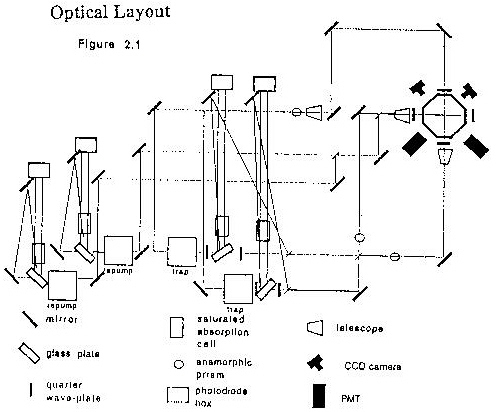 Trap sizes and positions are determined by a pair of CCD cameras which view the trap from orthogonal directions. Separate photomultiplier tubes monitor fluorescence from the two species, permitting measurement of the fill time of each trap in the presence or absence of the other. 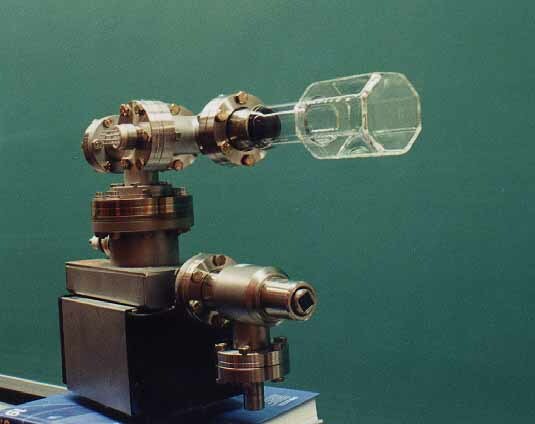 The apparatus is easily modified for simultaneous trapping of the two Rb isotopes. We have improved the optical arrangement by providing separate saturated absorption cells for each trap and repump laser, and by shortening the optical path lengths. Thick pyrex plates pick off probe beams for the saturated absorption cells. 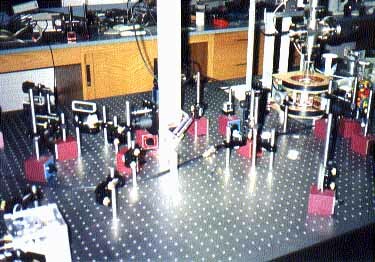 The trap laser beams are combined using nonpolarizing plate beamsplitters, and sent through anamorphic prism sets and expanding telescopes, and quarter wave plates producing ~2cm diameter circularly polarized beams at the trap cell. The repump beams are combined with the trap beams on one axis only. A pair of orthogonally positioned video cameras at the rear of the cell are used to ensure that the Rb and Cs traps overlap properly. The PMT's are located at the corresponding positions in front of the cell, with interference filters corresponding to the Rb and Cs wavelengths, respectively. 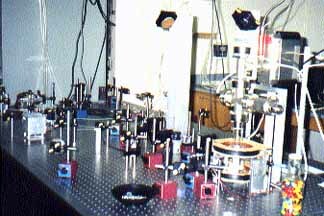 Each laser is locked to a saturated absorption profile by the circuit above. The inputs to this locking circuit come from the two photodiodes in the corresponding saturated absorption setup. One signal is negative and the other is positive. They are added to eliminate the Doppler background. 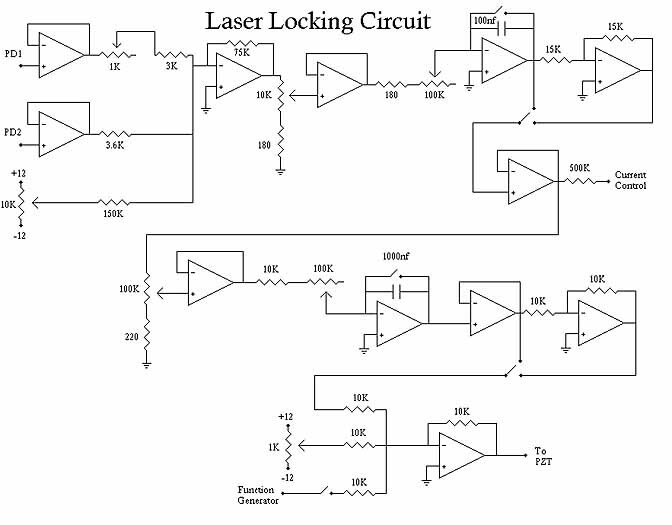 The circuit is used in two ways to lock the laser to the desired atomic transition. The output of the first integrator goes directly to the current input of the laser controller. This is used for rapid adjustments in the laser frequency. The output of the first integrator is then integrated again. The second integrator attempts to lock the laser current to its initial set point. The output of this second integrator goes to a PZT which controls the diffraction grating thereby altering the length of the external laser cavity. As shown in the above figure, the Rb fluorescence signal disappears while the Rb trap laser is briefly blocked. After unblocking this beam, the trap reforms exponentially. 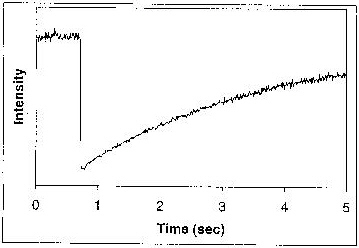 The 1/e trap fill time is determined from the slope of the corresponding log plot.